Our latest concert presented quite a challenge! The Cathedral of Cologne has an evening temperature (this time of year) of 15.3˚ C (59.4˚ F). That was with spotlights and extra spots from the television crew. As we bundled up to play Hans Werner Henze’s Requiem, we took great care in tuning. Actually, it wasn’t too bad, all things considered. From one equal-tempered semitone to the next there is a 6% increase in frequency. A 10˚C change in temperature is equal to a 2% change in pitch frequency. That’s a whole third of a semitone! The Cathedral air was not a whole 10 degrees below room temperature (22˚C) but it was enough to make things really tricky. 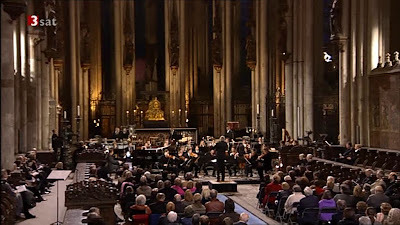 So what was it like playing in one of the world’s tallest cathedrals? The acoustics of the choir area (on the east end, behind the altar) are not bad. The choir of Cologne Cathedral, measured between the piers, holds the distinction of having the largest height to width ratio of any Medieval church, 3.6:1. [info from Wiki] The whole cathedral is so large and so high that it is almost like playing outdoors, you don’t get that “churchy” acoustic. The nave is 43.35 meters high (144.22 feet) – the 4th highest in the world. Only when you stop playing, do you hear a long, long, decay of the sound. When I stepped into the interior of the Cathedral for the first time in the summer of 1995 I almost cried, it was that moving and impressive. I am used to tall buildings, I’ve even been up the Sears tower in Chicago, but being inside such a vast structure is awe-inspiring. Imagine the impression it made on the pre-modern psyche! How to stay on top of these extreme situations, hot or cold? *keep flexible by practicing note bends – both ways. I find this absolutely crucial in piccolo playing. This entry was posted in Cologne Cathedral, intonation, temperature by admin. Bookmark the permalink. Thanks so much for the tips on intonation. 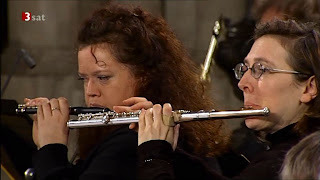 I think most flutists would agree that extreme temperatures create a huge challenge for us during performances. This is definitely something that I need to work on. I look forward to trying your suggestions.